If you like to fish bigger fish on light tackle, the Micro-disc reels are just what you�re looking for! 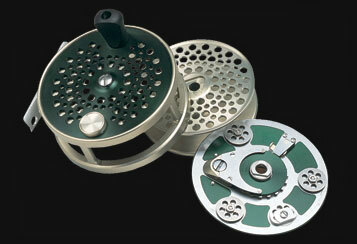 These reels retain a classic look and feel but incorporate technologies that were not available in the early 1900's. To maintain the classic look we use German Nickel Silver on the bearing cap, side cover lock and disc-drag adjustment knob (13 individual settings). The internal disc-drag uses a traditional cork drag plate on one side of the drag disc and a Teflon disc on the other side (our double-disc drag reels use cork on both sides for serious braking power!). Like our Classic reels, the fisherman can remove the side cover to change the spool, turn on/off the out going clicker, or adjust the range of the adjustable drag. These reels also have a palming rim that looks like it is part of the frame...it is actually a two-piece design that is anodized green in the center to match the opposite side cover, and champagne gold on the palming rim to match the frame and spool. Total run-out between the palming rim and frame is less than .002 inches...barely noticeable to the naked eye. Each reel is serialized and comes with an Arne Mason leather case, and a "Care & Instruction" manual. 10% Federal excise tax on all fishing tackle manufactured in the U.S. is included in the price of the reel.